According to the US Energy Information Administration (EIA), the share of US electricity fuelled by coal is expected to slowly begin growing when compared to the same period last year. In contrast, the share of generation from natural gas is expected to experience year-over-year declines. Based on expected temperatures and market conditions, coal is expected to surpass natural gas as the most common electricity generating fuel in December, January, and February. Natural gas-fired generation has surpassed coal-fired generation in most months since April 2015, and generation fuelled by natural gas reached record levels this past summer. 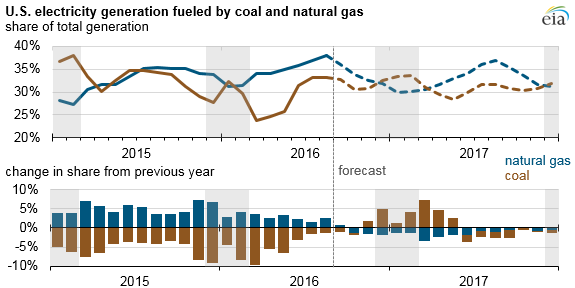 During the first six months of 2016, natural gas supplied 36% of total US electricity generation compared with 31% for coal. During periods where available generation capacity exceeds electricity load, selection of which capacity to run often reflects relative operating costs, which largely reflect generators' fueling cost. When measured in terms of the cost of fuel it takes to generate a megawatthour (MWh) of electricity, to account for the different efficiencies of power plants, the prices for natural gas and coal were relatively competitive for much of 2015. At the beginning of 2016, the national average price of natural gas was consistently below the cost of coal delivered to power plants, reaching a low point of about US$16/MWh in March, while coal has averaged between US$21/MWh and US$23/MWh for the past two years. Source: US Energy Information Administration, Short-Term Energy Outlook, November 2016 Note: Cost of fuel delivered to electricity generation (measured in $/mmBtu) converted to $/MWh using assumed heat rates of 10,000 Btu/kWh for coal and 7,200 Btu/kWh for natural gas. Spot prices for natural gas have generally been rising in recent weeks. The cost of natural gas delivered to electric generators, which includes both spot market and contract purchases, has been increasing as well. The latest available data indicate that the generation cost of natural gas averaged US$21.30/MWh in August, which was nearly identical to the cost of coal. EIA’s November Short-Term Energy Outlook (STEO) projects that natural gas prices delivered to the power sector will continue rising. The STEO forecasts the average natural gas generation cost to reach a seasonal peak of nearly US$31/MWh in February, which would be about 40% higher than the projected cost of coal for that month on a national average basis. Because coal costs vary widely across regions, relative fueling costs in particular markets may differ significantly from national averages. The higher costs of natural gas relative to coal are likely to encourage the industry to use more coal to fuel electricity generation than in the recent past. Forecast cooler winter temperatures also contribute to higher projected coal use in power generation. By the middle of 2017, increased generation from renewable energy sources is expected to reduce the generation shares of both coal and natural gas.